If you are currently unable to adopt a cat or are looking for an ideal gift for a loved one then perhaps you would like to sponsor one of these long-term residents? For £15 you can sponsor one of our very deserving cats for a year, contributing towards his or her ongoing medical expenses. You will receive a welcome pack with a photo of the cat you are sponsoring and regular updates on how he or she is getting on throughout the year. Archie came into the Glasgow Branch on the 28th January 2017. 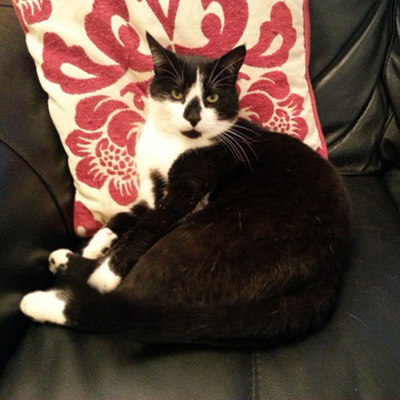 Archie is around 3 years old black and grey colouring with a deformed back paw. Archie had ripped the skin off the top of his head, his eyes were all swollen and looked in a very sorry state. He was first seen by a vet on the 3rd February, since then Archie has been on steroids, antibiotics and has been living with a protective collar ‘cone’ on for almost 7 months because he has very itchy dry skin manly on the right hand side of his face. Numerous tests found that Archie has a deep skin allergy which will be manage by being on medication for the rest of his life. Archie’s skin has to be shampooed and cleaned three times a week and eye drops administered. Archie has needed a lot of care to help him keep well. This has not been an easy take as Archie was not used to being handled, he wasn’t even litter trained when he came in. However over time Archie grew fond of this care and attention and it was this appreciative nature that made his fosterer fall in love with him and on the 6th May, Archie was adopted and found his forever home. 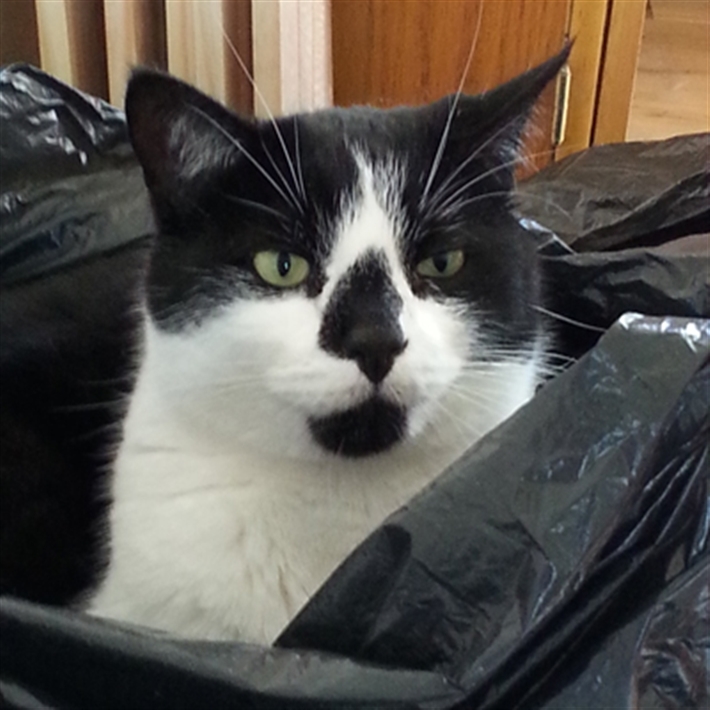 Archie had been doing so well enjoying outdoor life, sharing his house with five other cats. Then Archie decided to attack his face again. The CP Glasgow Branch decided we need to give Archie a better quality of life so he has recently been referred for dermatology tests. Archie will get further allergy tests/investigations done whilst under anaesthetic so see if his allergy can be determined. If you would like to help Archie receive the best care then why not sponsor him for £15 a year. Mary was found in September 2014 when she was just 8 weeks old. We received a call from a doctors surgery in Tollcross about a kitten in their bins outside. We managed to go out and get her, she was very frightened, underweight and suffering from flu. She is now just over 3 years old and doing well but still has some underlying medical issues that she is being receiving tests for at the vet at the moment. Freddie who suffers from Feline, Lower Urinary Tract Disease (FLUTD) is doing well and is on a special diet to help keep the condition under control. He likes to sit on the hearth, must enjoy the heat. He is a very gentle boy; he loves to sit at the sink, in the hope of catching a drip from the tap or just sitting watching the world go by. He likes to hang out down at the school in the hope that someone will stop and speak to him, and most people do. He likes to come for a walk round the block with our dog Lucy too. As you can see from the last photo he did not want his photo taken, he was being camera shy. Louise came into contact with her owner in Aug 2004, she came from the quarry in Kirkintilloch, she was brought in with her sister who was invloved in an accident the following December and sadly didn't survive. She's a great wee girl, she rubs on my legs when I'm putting her dinner out but soon as I touch her she backs off. This is Paddy, a 15 year old semi feral, who lives with his ownere and has done since he was a kitten. He was a feral kitten born in Drumchapel. He will not let us pet him, he is a very independent wee cat and can be very bossy when he likes, but he does gets on we'll with the other cats. His two brothers were homed but he decided it was not for him and came back into care. He loves the garden and he is the mouse catcher of the group, you can pet him when he is in the mood but this is not often. Paddy, is doing well had his coat stripped later summer for winter coming in and looking very handsome, needs that done as he will not let me brush him. He loves the outdoors and only comes in when it's very wet & windy. We got Gizzy and his brother Ozzy in January 2004 when they were about 12 weeks old. Both were feral, totally unfriendly, manic and semi wild. 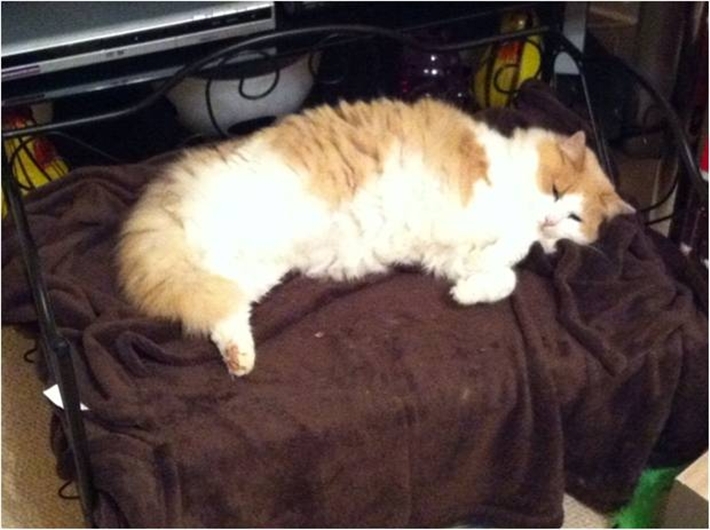 We persevered with them both and Ozzy was homed. Try as we might, we couldn't get Gizzy to come round, and, eventually we reached a compromise - he tolerated us – just! I still get frightened by my own shadow, (as well as the wind / weather / other cats / dogs / Mum and Dad / and most other things as well!) I am getting a bit braver and even risk a clap and tickle on Mum’s lap….but not Dad’s!....he’s too fierce for me, but I do let him have an odd clap at me when I’m sidling past him, but only when it suits me!